Surfactant protein D (SP-D) plays important roles in innate host defense against influenza A virus (IAV) infection, in part by modifying interactions with neutrophils. Human neutrophil defensins (HNPs) inhibit infectivity of enveloped viruses, including IAV. Our goal in this study was to characterize antiviral interactions between SP-D and HNPs. Recombinant and/or natural forms of SP-D and related collectins and HNPs were tested for antiviral activity against two different strains of IAV. HNPs 1 and 2 did not inhibit viral hemagglutination activity, but they interfered with the hemagglutination-inhibiting activity of SP-D. HNPs had significant viral neutralizing activity against divergent IAV strains. However, the HNPs generally had competitive effects when combined with SP-D in assays using an SP-D-sensitive IAV strain. In contrast, cooperative antiviral effects were noted in some instances when relatively SP-D-resistant strains were treated with SP-D and HNPs. HNPs were found to bind to the neck and/or carbohydrate recognition domain of SP-D. This binding was specific because no, or minimal, binding to other collectins was found. HNPs precipitated SP-D from bronchoalveolar lavage fluid and reduced the antiviral activity of bronchoalveolar lavage fluid. HNP-1 and -2 differed somewhat in their independent antiviral activity and their binding to SP-D. These results are relevant to the early phase of host defense against IAV, and suggest a complex interplay between SP-D and HNPs at sites of active inflammation. Influenza A virus (IAV)3 infections are a major cause of morbidity and mortality, causing ∼40,000 deaths per year in the United States (1). Recent episodes of transmission of avian IAV infection to humans underscore the ongoing potential for pandemic caused by IAV (2). Innate immune mechanisms provide important protection against IAV in the naive host. Among the innate immune proteins with significant anti-IAV activity are type I IFNs, TNF, the collectins, and defensins (3, 4, 5, 6). Surfactant protein D (SP-D) has a particularly important role both in restricting IAV replication and limiting the severity of inflammatory responses during the first several days of infection (7, 8, 9, 10, 11, 12, 13). SP-D has strong antiviral activity and mediates several other important functions some of which may be important during infection, including maintenance of surfactant homeostasis in the lung, clearance of apoptotic cells, enhancement or inhibition of uptake of various organisms by phagocytes, and inhibition of inflammatory reactions in the lung (8, 14, 15, 16, 17, 18, 19). SP-D could also contribute to adaptive immune responses through facilitating presentation of Ag by dendritic cells (20) and decreasing lymphocyte activation and proliferation (21). SP-D has also been shown to bind to a select few host molecules including scavenger receptor rich gp340, microfibril-associated protein 4, decorin, and DNA (22, 23, 24, 25, 26). gp340 has significant anti-influenza activity in its own right (27). Relatively few studies have evaluated the functional antimicrobial interactions between innate defense proteins in the respiratory tract or other portals of infection (28, 29). Like the collectins, defensins have antimicrobial activity against a variety of organisms including bacteria, fungi, and enveloped viruses (30). Both α- and β-defensins are present in the respiratory tract and gastrointestinal tract, sites where they could potentially interact with SP-D (31). In humans, α-defensins are stored and released in large quantities from neutrophil granules during infectious and inflammatory states (32, 33) and are referred to as human neutrophil peptides (HNP) 1, 2, or 3. HNPs are basic peptides 29–30 aa in length. HNPs 1–3 differ by a single N-terminal amino acid. The peptides have a cyclic structure with spatial segregation of charged and hydrophobic residues. It has been proposed that this amphiphilic structure could permit defensins to insert into the membranes of target organisms. In addition to their direct antimicrobial activities, defensins have a variety of other activities relevant to innate or adaptive immunity. HNPs inhibit complement activation, through interaction with the collagen domain of C1q (34). Defensins have chemotactic activity for monocytes, T cells, and dendritic cells, stimulate IL-8 production by epithelial cells, bind to lipid bilayers, and contribute to respiratory cell activation, injury or growth under some circumstances (35, 36, 37, 38, 39, 40, 41). During ongoing studies of the interactions of various known or suspected antiviral proteins present in respiratory or oral secretions, we noted that HNPs interfered with the ability of SP-D to block hemagglutination (HA) activity of IAV. In the current paper we demonstrate for the first time that SP-D binds to HNPs, and characterize the mechanism of binding and the functional interactions of HNPs with SP-D with respect to IAV. These findings are relevant to infection with IAV (and other pathogens) because neutrophils are recruited to the respiratory tract early in the course of IAV infection where they can interact with SP-D (12, 42, 43). SP-D also inhibits the deactivation of neutrophils by IAV, a property that could prevent bacterial superinfection, a major cause of morbidity and mortality during IAV epidemics (44, 45). Recently, neutrophil-derived serine proteases were shown to impair microbial-binding activity of SP-D (46). Our findings indicate that similar effects could result from interaction of neutrophil defensins with SP-D at sites of active inflammation. Dulbecco’s PBS (PBA) containing 0.9 mM calcium and 0.493 mM magnesium and PBS without calcium and magnesium were purchased from Invitrogen Life Technologies. PBS with added calcium and magnesium (pH 7.2) was used unless otherwise indicated. IAV was grown in the chorioallantoic fluid of 10-day-old chicken eggs and purified on a discontinuous sucrose gradient as previously described (47). The virus was dialyzed against PBS without added calcium or magnesium to remove sucrose, aliquoted, and stored at −80°C until needed. Philippines 82/H3N2 (Phil82) strain was provided by Dr. E. Margot Anders (University of Melbourne, Melbourne, Australia). The A/PR/8/34/H1N1 (PR-8) strain was a gift from Dr. J. Abramson (Bowman Gray School of Medicine, Winston-Salem, NC). The HA titer of each virus preparation was determined by titration of virus samples in PBS with thoroughly washed human type O, Rh(−) RBC as described previously (47). Postthawing the viral stocks contained ∼5 × 108 PFU/ml. The collectins used in this study are summarized in Table I⇓. Viral neutralizing and aggregating activities as shown in prior studies are indicated. Recombinant human SP-D (RhSP-D) was produced in stably transfected CHO-K1 cells as previously described (9). For these studies, the dodecameric fraction of RhSP-D was used unless otherwise specified. A chimeric collectin containing the human SP-D N-terminal and collagen domains and human mannose-binding lectin (MBL) neck and carbohydrate recognition domains (CRD; called SP-D/MBLnCRD) was produced as expressed in CHO cells as previously described (48). RfSP-DnCRD is a trimeric preparation containing the neck and carbohydrate recognition domains (CRD) of human SP-D that was prepared in Escherichia coli as recently described (49). Human alveolar proteinosis SP-A was provided by J. Whitsett (Children’s Hospital Medical Center, Cincinnati, OH). RhMBL was expressed in CHO-K1 cells, purified as described (50), and was provided (along with the mAb 113.1) by Drs. K. Takahashi and R. A. B. Ezekowitz (Department of Pediatrics, Harvard Medical School, Boston, MA). Natural human SP-D was isolated from amniotic fluid as previously described (51). A pool of amniotic fluid (n = 6) was centrifuged at 4000 rpm and 4°C for 30 min and purified by maltosyl agarose affinity chromatography. SP-D eluted as two structural different forms and was collected in fractions 3, 4 (high molecular mass SP-D), and 6, 7 (low molecular mass SP-D), respectively. As previously demonstrated, the high molecular mass fraction consists predominantly of dodecamers, whereas the low molecular mass fraction consists of trimers. The collectin preparations used in this report were tested for degree of contamination with endotoxin using a quantitative endotoxin assay (Limulus Amebocyte Lysate; BioWhittaker). The final concentrations of endotoxin in protein samples containing the highest concentrations of collectins were ∼20–100 pg/ml (or 6–12 endotoxin units/ml using internal assay standard). HNP-1 and HNP-2 were purchased from Bachem Bioscience. The levels of endotoxin in the HNP preparations were 15 and 25 pg/μg protein, respectively, for HNP-1 and -2. Normal volunteer donor BAL fluid was obtained under a protocol approved by the Boston University Medical Center Institutional Review Board. The amniotic fluid from which natural SP-D was purified was obtained from Caesarian sections performed at 38–42 wk gestation. This was approved by the local ethics committee in Copenhagen and Fredericksburg. Binding of collectins to HNPs was assessed by ELISA. Plates were coated with 10 μg/ml HNP-1 or -2 in coating buffer overnight at 4°C. Following washing with PBS, the plates were blocked with PBS containing 2.5% fatty acid and endotoxin-free BSA (Sigma-Aldrich; fraction V, fatty acid free and low endotoxin; A8806) for 3 h. These HNP-coated plates were then incubated with collectin samples, followed by addition of mAbs against SP-D (mAb 246-04), SP-A (mAb 238-01), or MBL (mAb 113.1 for MBL or SP-D/MBLneck+CRD). Incubation of collectins with HNPs was performed in PBS (2 mM calcium and magnesium), but in some instances either EDTA (10 mM) or maltose (100 mM) was included during the incubation. Binding was detected using mAbs directed against SP-D, SP-A, or MBL and HRP-labeled goat-anti-mouse Abs. The only exception was that binding of RfSP-DnCRD was detected by first biotinylating the collectin as described (52) and detecting with streptavidin-HRP. TMB substrate (Bio-Rad) was added and the reaction was stopped using 1 N sulfuric acid (H2SO4). The OD was measured on an ELISA plate reader at a 450-nm wavelength. Each individual data point was performed in duplicate. Background nonspecific binding was assessed by coating plates with fatty acid-free BSA but no HNP and performing the collectin-binding assay as outlined above. Fig. 3⇓A shows results of binding of SP-D to BSA. In subsequent results, binding to BSA was subtracted from the collectin-binding values. HNPs and RhSP-D or RfSP-DnCRD were incubated alone or in combination for 10 min at room temperature followed by centrifugation at 16,000 × g for 5 min in a microfuge. The supernatants were removed carefully and precipitated protein was resuspended in an equal volume of PBS. The samples were then SDS-PAGE under reducing conditions. HA inhibition was measured by serially diluting collectin or other host defense protein preparations in round-bottom 96-well plates (Serocluster U-Vinyl plates; Costar) using PBS as a diluent. After adding 25 μl of IAV, giving a final concentration of 40 HA units (HAU)/ml or 4 HAU/well, the IAV/protein mixture was incubated for 15 min at room temperature, followed by addition of 50 μl of a type O human erythrocyte suspension. The erythrocytes were suspended at a ratio of 200-μl erythrocytes/30 ml of PBS. The minimum concentration of protein required to fully inhibit the hemagglutinating activity of the viral suspension was determined by noting the highest dilution of protein that still inhibited HA. Inhibition of HA activity in a given well is demonstrated by absence of formation of an erythrocyte pellet. If no inhibition of HA activity was observed at the highest protein concentration used then the value is expressed as greater than the maximal protein concentration. HNPs did not cause any lysis of erythrocytes at concentrations up to 50 μg/ml (data not shown). Madin-Darby canine kidney (MDCK) monolayers were prepared in 96-well plates and grown to confluency. These layers were then infected with diluted IAV preparations for 30 min at 37°C in PBS, followed by washing of the monolayer three times in serum-free DMEM containing 1% penicillin and streptomycin. The monolayers were then incubated for 7 h at 37°C with 5% CO2 in DMEM. The monolayers were subsequently washed three times with PBS and fixed with 80% acetone (v/v) for 10 min at 4°C. The monolayers were then labeled by incubating with mAb directed against the influenza A viral nucleoprotein (provided by Dr. N. Cox, Centers for Disease Control, Atlanta, GA) in reagent A (PBS with 0.1% BSA, 1% heat-inactivated human serum, 0.02% NaN3) for 30 min at 4°C. The monolayers were washed three times in PBS and incubated with FITC-labeled goat anti-mouse IgG. The fluorescent foci were counted directly under fluorescent microscopy. Initially, various dilutions of virus were used to find the dose yielding ∼50 fluorescent foci per high powered (×40) field. These foci appeared to be single infected cells in general. In most experiments, IAV was preincubated for 30 min at 37°C with HNPs and/or SP-D or control buffer, followed by addition of these viral samples to the MDCK cells. Statistical comparisons were made using the Student paired, two-tailed t test or ANOVA with post hoc test (Tukey’s). We initially tested antiviral activities of HNPs 1 and 2 against two divergent strains of IAV, the Phil82 strain, which is representative of recently circulating H3N2 strains, and the PR-8 strain, which is a mouse-adapted H1N1 strain used frequently in in vivo studies of pathogenesis of IAV. These strains are also of interest because the former strain contains high mannose carbohydrates on envelope glycoproteins that render it sensitive to inhibition by calcium-dependent lectins (e.g., SP-D), whereas the latter does not. The IAV hemagglutinin mediates attachment to host glycoconjugates. Neither HNP1 nor HNP2 had any activity on the hemagglutinin inhibition assay at concentrations up to 25 μg/ml (Table II⇓). However, the HNPs had clear dose-related viral-neutralizing activity using the infectious focus assay (Fig. 1⇓). This assay tests the ability of HNPs to inhibit initial infection of MDCK cells before the point of generation of viral nucleoprotein. Hence, the HNPs inhibit replication of two divergent IAV strains during the first round of viral infection. Of interest, HNP1 had greater activity than HNP2 against both viral strains. Furthermore, both HNP1 and HNP2 had greater activity against the PR-8 strain than against the Phil82 strain. Neutralization of IAV strains by HNP1 and HNP2. Viral neutralization by HNPs 1 and 2 was measured using the infectious focus assay. Upper panel, Results shown involved preincubation of the indicated IAV strains with HNPs. Both HNPs caused significant reduction in viral infectivity at all the concentrations tested. Results are mean ± SEM of five experiments. Both HNPs caused significantly greater inhibition of the PR-8 strain than of the Phil82 IAV strain. HNP1 caused greater inhibition of either strain than HNP2. Significant differences were determined by ANOVA with Tukey’s post hoc testing. In preliminary studies, we found that HNPs antagonize the HA-inhibiting activity of SP-D against the Phil 82 strain of IAV (see Table II⇑). This antagonistic effect occurred with both RhSP-D dodecamers and high molecular mass multimers of RhSP-D. Of note, the competitive effect was not observed when combining HNPs with SP-A, MBL, or with the SP-D/MBLnCRD chimera. The SP-D/MBLnCRD chimera differs from SP-D in that the neck and CRD are replaced with those of MBL. In the case of SP-A and HNP1, additive HA-inhibiting activity was observed. These results indicate a specific interaction between the SP-D neck and/or CRD and HNPs. A somewhat different pattern was observed with respect to the PR-8 strain of IAV. HNPs 1 or 2 again did not have any independent HA-inhibiting activity against this strain of IAV at concentrations up to 25 μg/ml (data not shown). As previously reported, RhSP-D at concentrations up to 800 ng/ml had no HA-inhibiting activity against the PR-8 strain (data not shown). However, addition of 25 μg/ml HNP-1 to SP-D allowed SP-D to have measurable HA inhibitory activity (i.e., 46 ± 4 ng/ml SP-D inhibited 40 HAU of PR-8 strain of IAV; n = 3). Hence, in this instance HNP-1 and SP-D had a cooperative antiviral effect. Competitive effects of SP-D and HNPs were also seen with respect to neutralization of the Phil 82 strain using the infectious focus assay (Fig. 2⇓). When HNP 1 or 2 was preincubated with SP-D before incubating with the virus, a significant reduction in neutralizing activity occurred as compared with either SP-D or HNP alone. In additional control experiments, we preincubated the virus with SP-D alone and then added this mixture to the MDCK cells followed 10 min later by addition of HNPs. Under these conditions, HNPs did not inhibit the activity of SP-D. Similarly, if HNPs were added first followed by delayed addition of SP-D, no competitive effect was observed. This result suggests that SP-D and HNPs bind to each other in such a way that subsequent binding of either protein to the virus is reduced. Effect of recombinant SP-D trimers or dodecamers on neutralizing activities of HNP1 or HNP2 against the Phil82 strain of IAV. Upper panel, The effect of HNPs (5 μg/ml) or RhSP-D multimers (90 ng/ml) on infectivity of the Phil 82 strain of IAV (assessed as in Fig. 1⇑). Results are expressed as the percent of control infectious foci and are mean ± SEM of at least three experiments. RhSP-D, HNP1, and HNP2 caused significant reduction in viral infectivity. However, preincubation of SP-D with either HNP resulted in significantly less inhibition of infectivity than was obtained with either RhSP-D or the HNPs alone (indicated by ∗). If RhSP-D was added to virus first and then cells were infected followed 10 min later by addition of HNPs (“SP-D then HNP”), HNPs caused no reduction in neutralizing activity of SP-D. Similar results were obtained if HNPs were first added followed by delayed addition of RhSP-D (“HNP then SP-D”). Lower panel, The effects of preincubating HNPs with RfSP-DnCRD. RfSP-DnCRD is a trimeric preparation composed of just the neck and CR domains of human SP-D. RfSP-CnCRD trimers had no significant effect on viral infectivity (data not shown). HNP1 or 2 (10 μg/ml) alone inhibited viral infectivity as expected. However, preincubation of HNPs with RfSP-CnCRD trimers significantly reduced neutralizing activities of HNP1 or 2 (where indicated by ∗; p < 0.05 as assessed by ANOVA). RfSP-DnCRD is a truncated, trimeric form of SP-D containing only the neck and CRD of human SP-D. RfSP-DnCRD shows no independent IAV neutralizing activity (Ref. 49 and data not shown). However, preincubation of HNP1 or 2 with RfSP-DnCRD significantly reduced the neutralizing activity of the HNPs (Fig. 2⇑, lower panel). This suggests that the neck and CRD of SP-D are sufficient to interfere with the antiviral activity of HNPs. In solid-phase ELISA, RhSP-D dodecamers bound to HNP1 and 2 in a dose-dependent manner (Figs. 3–5⇓⇓⇓). Low ionic strength and low pH are known to increase binding of HNPs to some microbial ligands. As shown in Fig. 3⇓, these conditions also increased binding of HNPs to RhSP-D dodecamers. SP-D bound most strongly to HNPs at acidic pH and binding diminished progressively with increasing pH. This was in contrast to binding of SP-D to IAV, which was optimal at physiological pH and diminished at either acidic or basic pH. As shown in the lower panel of Fig. 3⇓, RfSP-DnCRD bound significantly to HNP indicating that the neck and CRD of SP-D are sufficient for binding to HNPs. 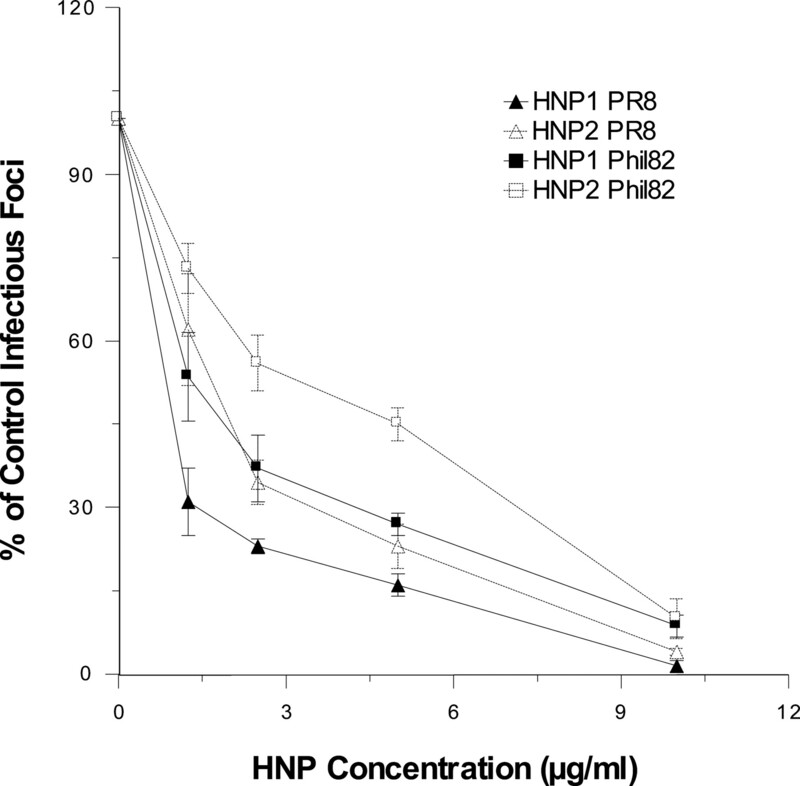 Given the low levels of endotoxin found in the HNP preparations, it is unlikely that endotoxin associated with HNPs caused binding to SP-D. To further test this, we preincubated HNPs with various concentrations of endotoxin. This addition of endotoxin (even at concentrations up to 500 ng/ml) did not alter binding of SP-D to HNPs (data not shown). 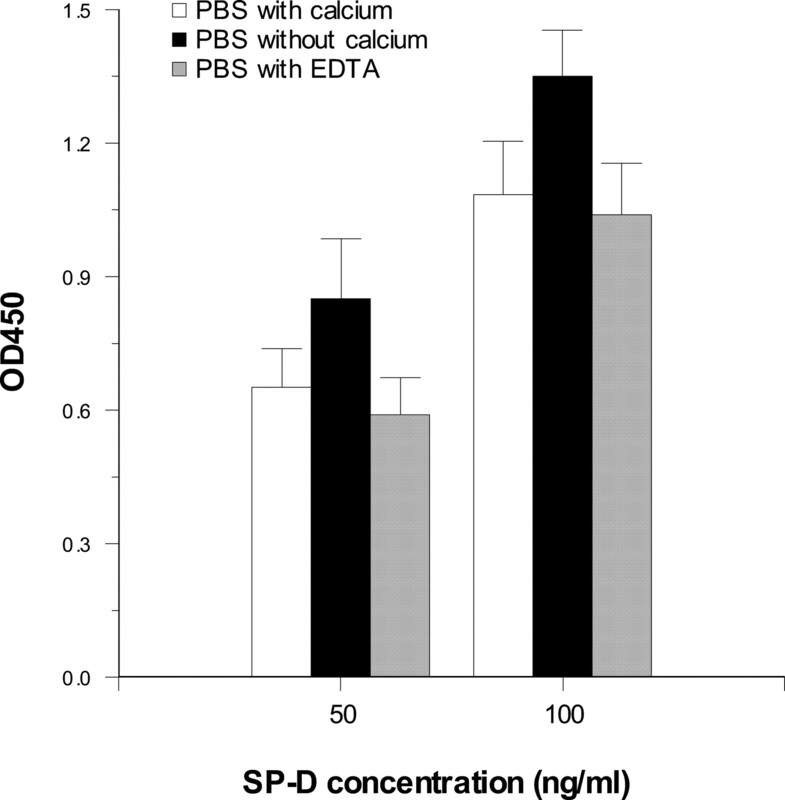 Binding of SP-D was not calcium dependent (Fig. 4⇓) nor was it inhibited by maltose (data not shown). Overall, these results indicate that binding of SP-D to HNPs differs mechanistically from its binding to IAV or other microbial ligands. Binding of RhSP-D to HNPs. Binding of SP-D to HNPs was tested by ELISA in which plates were coated with HNP2 (25 μg/ml). A, Dose response of binding of RhSP-D dodecamers to HNP2. Background binding to plates coated with fatty acid and endotoxin-free BSA is shown in the upper panel. Binding of SP-D to HNP2 was significantly greater than biding to BSA at all concentrations of SP-D tested (p < 0.05; n = 5 experiments). B, Reducing ionic strength of PBS by one-half during incubation of RhSP-D dodecamers with HNP2 increased binding as compared with normal ionic strength PBS. C, The effect of buffer pH on binding of RhSP-D to HNP2 or IAV (4 μg/ml) was tested using PBS adjusted to the indicated pH values (n = 3 independent ELISAs) Similar results were obtained with HNP1 (data not shown). D, Binding of to HNP2 to RfSP-DnCRD. Binding was assessed using biotinylated RfSP-DnCRD. 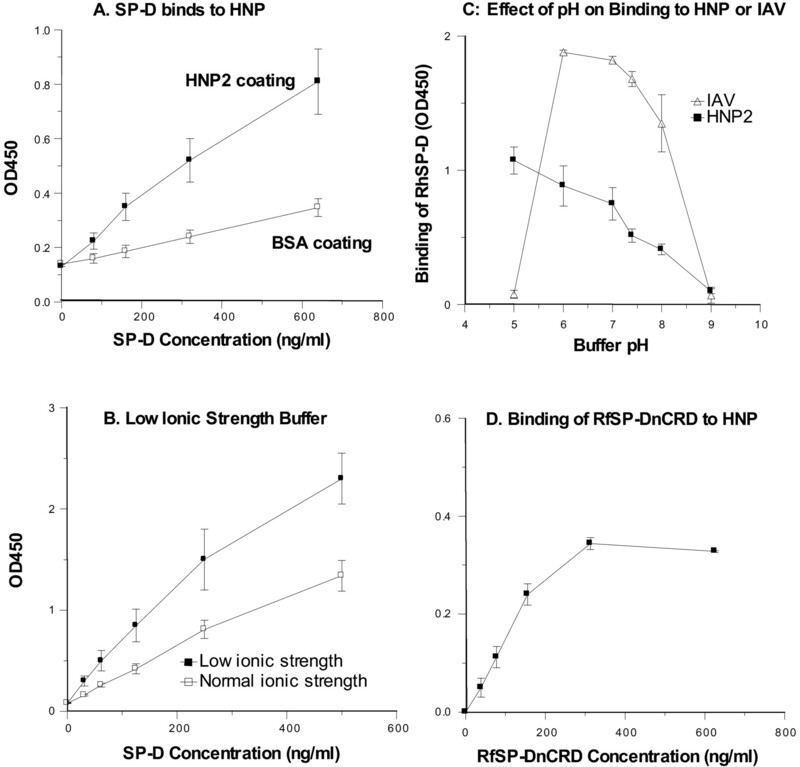 Binding of RfSP-DnCRD to HNP2 was significantly greater than background binding to BSA-coated plates (subtracted from results shown) (p < 0.05; n = 3). Effect of calcium on binding of SP-D to HNP2. HNP2 was coated onto ELISA plates as in Fig. 3⇑. RhSP-D dodecamers were added at the indicated concentrations in PBS containing calcium, PBS without added calcium, or PBS without added calcium and with added EDTA (10 mM). The pH for all buffers was maintained at 7.2. Binding of SP-D was measured as in Fig. 3⇑. Background binding to BSA coated plates was subtracted from the results shown before analysis. Results shown are mean ± SEM of three independent experiments. 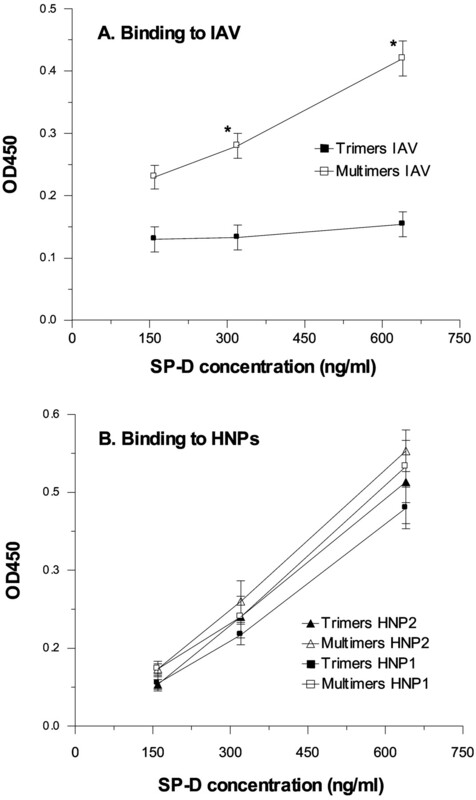 There was no significant difference in binding of SP-D to HNP2 in the different buffers as assessed by ANOVA. Minimal binding of SP-A, MBL or SP-D/MBLnCRD to HNPs – Binding of MBL or SP-A to HNP1 or 2 was tested by ELISA (as in Fig. 3⇑). A, Binding of RhMBL to IAV (Phil82 strain) or HNPs 1 and 2. MBL had very low (although statistically significant; p < 0.05) binding to HNP2. Results are mean ± SEM of four experiments. Binding of MBL to HNP-1 was not significantly greater than binding to BSA. B, Binding of native human SP-A to IAV (PR-8 strain) or HNPs. Despite highly significant binding to IAV (PR-8 strain) (p < 0.004), SP-A did not bind to HNPs. C, Binding of RhSP-D or SP-D/MBLnCRD dodecamers to HNP1. In this case, binding of RhSP-D was significantly greater than binding of SP-D/MBLnCRD (p < 0.04). Bound RhSP-D was detected with an mAb directed against SP-D. Bound SP-D/MBLnCRD was detected with an mAb against MBL. Similar results were obtained when testing binding of SP-D and SP-D/MBLnCRD to HNP2 (data not shown). Binding of SP-D/MBLnCRD to HNP1 or 2 was significantly greater than background binding of SP-D/MBLnCRD to BSA (p < 0.005; B and data not shown). Results are mean ± SEM of three experiments. RhMBL showed minimal binding to HNPs (Fig. 5⇑). Similarly, SP-A did not bind to HNPs at the concentrations tested (Fig. 5⇑). Binding of MBL and SP-A to IAV was confirmed in parallel assays. These results suggest that binding of SP-D to HNPs is relatively specific and may not involve binding to the collagen domain as in the case of binding to C1q. In fact, C1q caused only minimal inhibition of binding of SP-D to HNPs (data not shown). These results suggest that HNPs bind specifically to the neck and CRD of SP-D. To further confirm this, we tested binding of the SP-D/MBLnCRD chimera (48). Binding of RhSP-D dodecamers to HNP1 significantly exceeded binding to dodecamers of the SP-D/MBLnCRD chimera (Fig. 5⇑). Similar results were obtained for binding of RhSP-D and the chimera to HNP2 (data not shown). This result indicates that the neck and/or CRD of SP-D are critical for binding to HNPs. It is possible that some of the variation in apparent binding of SP-D and the other collectins resulted from differences in recognition by the different Abs. However, we feel this is unlikely given strong binding of SP-A and MBL to IAV. Also, prior studies showed that mAbs gave very similar levels of detection of SP-D and the SP-D/MBLnCRD chimera and gave comparable results to binding assays using biotinylated collectins (53). Natural human SP-D varies in degree of multimerization and serum concentration depending on a polymorphisms, including one involving amino acid 11 in the N-terminal domain of the molecule (51). Subjects homozygous for threonine at this position (17% of Danish population) have lower serum levels of SP-D and the molecule exists predominantly in a trimeric form, whereas those homozygous for methionine (35% of Danish population) have higher serum levels and the protein is predominantly present in the form of dodecamers. We isolated high molecular mass (predominantly dodecameric) and low molecular mass (predominantly trimeric) SP-D from amniotic fluid as described. These natural human SP-D fractions isolated from amniotic fluid also bound to HNPs (Fig. 6⇓). As a control, binding of natural SP-Ds to IAV was tested in parallel. As previously reported, the natural SP-D dodecamers bound more strongly to IAV than trimers. Of interest, however, the two fractions bound equally to HNP1 and 2. This finding again indicates that the mechanism of binding of SP-Ds to HNPs differs from that of binding to IAV. Binding of natural human SP-D trimers and dodecamers to IAV and HNPs. Predominantly trimeric and dodecameric fractions of natural human SP-D were purified from amniotic fluid. Binding of these to ELISA plates coated with Phil82 IAV or with HNPs were tested by ELISA (as in Fig. 3⇑) but using a polyclonal Ab to SP-D for detection. Binding of multimers was significantly greater than binding of trimers to IAV (p < 0.03 as indicated by ∗; A). There was, however, no significant difference in binding of natural human SP-D multimers and trimers to HNP2 or HNP1 (B). Results are mean ± SEM of three separate experiments. 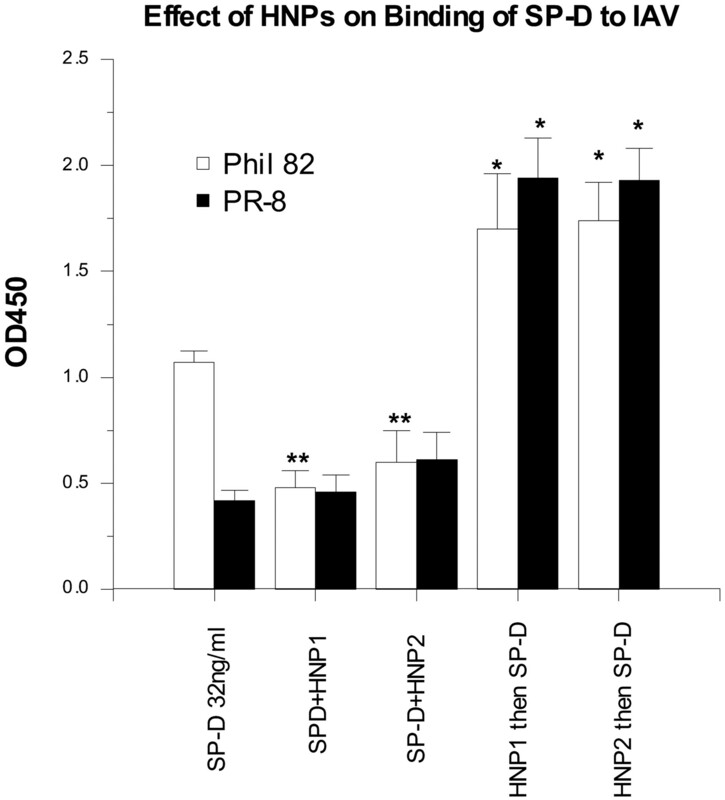 We tested binding of RhSP-D to the Phil 82 and PR-8 strains and as previously reported binding to Phil 82 was significantly greater than binding to PR-8 (Fig. 7⇓). Preincubation of SP-D with either HNP1 or 2 reduced binding to the Phil 82 strain of IAV. In contrast, if either strain of IAV was first incubated with HNPs followed by addition of SP-D, binding of SP-D was significantly increased. Hence, the effect of HNPs on binding of SP-D to IAV can differ depending on the sequence of addition of HNP, and that under some circumstances HNPs may increase binding of SP-D to IAV (including to SP-D-resistant strains like PR-8). Effect of HNPs on binding of SP-D to IAV strains. ELISA plates were coated with either the Phil 82 or PR-8 strain of IAV (4 μg/ml) and then incubated with either SP-D alone (32 ng/ml RhSP-D dodecamers), combinations of SP-D and HNPs (SP-D + HNP), or HNP first followed by SP-D (HNP then SP-D). The concentration of HNPs used was 10 μg/ml. The HNP + SP-D samples were preincubated together for 30 min at 37°C before addition to the virus-coated plates. In the case of HNP, then SP-D samples, HNPs were first added to the virus-coated plates for 30 min at 37°C, then the plates were washed in PBS before addition of SP-D. Preincubation of SP-D with HNP1 or 2 significantly reduced binding of SP-D to the Phil82 strain of IAV (∗∗). In contrast, preincubation of either Phil82 or PR-8 strain of IAV with HNPs significantly increased binding of SP-D (∗). Results are mean ± SEM of four experiments. As shown in Fig. 8⇓A, SP-D in normal donor BAL fluid bound to HNP1 or 2. This indicates that SP-D binds to HNP in presence of other normal lung fluid components. Similar results were obtained with BAL fluid from an additional donor (data not shown). Addition of HNPs to normal donor BAL fluid caused precipitation of SP-D (Fig. 8⇓B). In these assays, HNPs were incubated with BAL fluid for 30 min at 37°C followed by centrifugation at 16,000 × g for 5 min. Compared with HNP1, HNP2 caused a greater degree of precipitation of SP-D in this assay. Using BAL fluid from an additional donor, various concentrations of HNPs were added before centrifugation (Fig. 8⇓C). In this case, SP-D concentrations in the supernatant were measured before and after centrifugation. A standard curve for calculation of SP-D levels was obtained using rSP-D. Both HNPs caused the majority of SP-D to precipitate at concentrations of 12.5 μg/ml or higher. No significant difference was seen between HNP1 or 2 in these experiments. We also tested whether the HNPs would cause precipitation of SP-D from BAL fluids using lower speed centrifugation. After incubation of BAL fluid with 100 μg/ml HNPs and centrifuging at 1000 × g for 5 min, nearly all SP-D was lost from the supernatant: the mean control SP-D level was 116 ± 17 and levels after incubation with HNP1 and 2 were, 4.3 ± 1.6 and 3.4 ± 1.3 ng/ml, respectively (n = 3; p < 0.02 for either HNP compared with control). SP-D in normal donor BAL fluid binds to HNP. In A, increasing volumes of normal donor BAL fluid was incubated with ELISA plates coated with HNPs 1 or 2 (10 μg/ml) and binding was detected using an mAb directed against SP-D. The amount of BAL fluid added is expressed as μl/50 μl of buffer added to each well. Results are mean ± SEM (n = 3) and binding was significantly increased compared with binding to BSA-coated plates (subtracted from the values shown) (p < 0.05). Similar results were obtained using BAL fluid from another healthy donor (data not shown). In B, HNPs (100 μg/ml) were incubated with BAL fluid for 30 min at 37°C followed by centrifugation at 16,000 × g for 5 min. Levels of SP-D in the supernatant and pellet were then measured by ELISA. The results shown are mean ± SEM of five experiments and are expressed as the percent of SP-D in pellet compared with total SP-D in pellet and supernatant. In absence of HNPs, there was minimal precipitation of SP-D into the pellet. Both HNPs caused significant precipitation of SP-D into the pellet in this assay as assessed by ANOVA. Compared with HNP1, HNP2 caused a significantly greater degree of precipitation of SP-D in this assay as assessed by ANOVA. A Western blot of the supernatant and pellet from a representative experiment is shown in Fig. 9⇓B. Similar results were obtained using whole BAL fluid (▪) or BAL fluid from which large aggregate surfactant and most of SP-A were removed by prior centrifugation at 10,000 × g (□). C, BAL fluid from another donor was incubated with differing concentrations of HNPs as shown and samples centrifuged as in B. In this case, ELISA to measure SP-D concentration in the supernatant was performed (mean ± SEM; n = 3). All concentrations of HNPs used caused significant reduction in SP-D concentrations in BAL fluid (p < 0.05). A similar assay was performed using rSP-D preparations and HNPs (Fig. 9⇓A). There was minimal precipitation of RfSP-DnCRD or HNPs alone in this assay. However, the SP-D preparations and HNPs precipitated when coincubated before centrifugation. Similar results were obtained with RhSP-D dodecamers (data not shown). Western blots were also performed to detect SP-D in BAL fluid after incubation with HNP2 as described in Fig. 8⇑ (Fig. 9⇓B). SP-D coprecipitates with HNPs. RfSP-DnCRD or BAL fluid (as indicated) were incubated either alone or combined with HNPs. Incubation was for 10 min at room temperature. After this, samples were centrifuged for 5 min at 16,000 × g. Pellets and supernatants were separated and pellets resuspended in an equal volume of buffer as the original sample. Samples then were subjected to SDS/PAGE under reducing conditions. SP-D appears at ∼40 kDa whereas HNPs are at ∼4 kDa. RfSP-DnCRD (1.7 μg in 15 μl of PBS) and HNP-2 (1.7 μg) were used in A. The left three lanes in each figure show pellets, and the right three show supernatants. Samples containing SP-D preparations or HNPs alone are indicated as are those containing HNP and SP-D preparations incubated together (“Both”). RfSP-DnCRD or HNPs precipitated very little on their own but almost completely precipitated when coincubated. Results shown are with HNP2 although similar results were obtained with HNP1 (data not shown). These results are representative of three or more similar experiments. 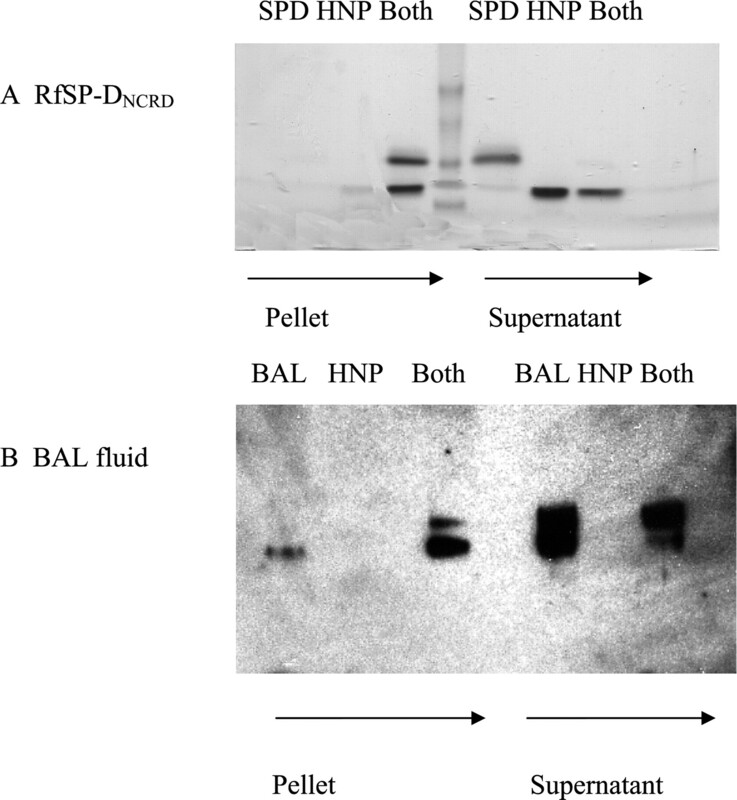 B, HNP2 was added to BAL fluid and Western blot was performed using polyclonal Ab against SP-D. Note increased precipitation of SP-D into pellet in the presence of HNP. We tested the effect of adding HNP1 to BAL fluid of two healthy volunteer donors (Table III⇓). As previously reported, normal donor BAL fluid inhibited HA activity of the Phil 82 strain of IAV (Table III⇓ and Ref. 27). When HNPs alone were tested in parallel in these experiments, no HA inhibition was observed. However, addition of HNP1 to BAL fluids of two different volunteer donors significantly reduced HA inhibitory activity of the fluid. To determine whether this reflected interaction of HNP1 with surfactant phospholipids or SP-A, we prepared 16,000 × g supernatant of BAL fluid from one of the donors. This procedure largely removes SP-A and surfactant lipids from the BAL fluid. Of interest, this supernatant had equivalent HA inhibitory activity as the whole BAL fluid (Table III⇓). Addition or HNP1 significantly reduced HA inhibitory activity of the BAL fluid supernatant as well. BAL fluid samples with or without added HNP1 were also tested for viral neutralizing activity using the infectious focus assay. Both BAL fluid and HNP1 had strong neutralizing activity against IAV (i.e., 10 μg/ml HNP1 reduced infectivity by 92 ± 2% and 25 μl of BAL fluid added to 500 μl of viral suspension reduced infectivity by 49 ± 3% compared with control; n = 3; p < 0.05 for either compared with control). When both HNP1 and BAL fluid at the same concentrations were added to the viral suspension, infectivity was reduced by 76 ± 0.2%. The degree of reduction was significantly less than observed with HNP1 alone as assessed by ANOVA. Hence, there was less than additive neutralizing activity in this assay. IAV undergoes both antigenic drift as a result of minor mutations in the viral envelope proteins, and antigenic shift resulting from reassortment of human viral strains with animal strains (54). Adaptive immune responses to one strain of IAV do not afford lasting protection such that epidemic and pandemic IAV remain major public health concerns. Innate immune mechanisms appear to provide some measure of protection against IAV. Although the majority of individuals recover from IAV infection, some experience severe morbidity or mortality. The outcome of IAV infection depends on the viral strain or on the ability of the host to mount an effective adaptive immune response. It is also likely that differences in innate immune capabilities influence the severity of IAV infection in naive hosts. It is possible that innate immune proteins and cells have significant interactions with each other that could modify the outcome of infection. In this study, we characterize the interactions of HNPs with IAV and demonstrate functionally significant interactions of HNPs with SP-D. Previous studies have shown that HNPs inhibit infectivity of enveloped viruses (3, 55). Activity of HNPs against IAV was only reported in one study (3). More complete evaluation of activity of HNPs against HIV have recently been conducted (56, 57). HNPs have strong anti-HIV activity and could contribute to host defense against the virus. Neutrophils have been found to contribute to host defense against IAV and other viruses (58, 59, 60), and release of HNPs could be one the mechanisms for this activity of neutrophils. In this study, we confirm the IAV-neutralizing activity of HNPs 1 and 2. Neutralizing activity of these HNPs is distinct from that of SP-D because the HNPs inhibited the SP-D-resistant strain, PR-8. Of interest, neutralizing activity of both HNPs was greater against the PR-8 strain than against the Phil 82 strain. This raises the possibility that the markedly reduced carbohydrate attachments on the envelope proteins of this strain (61) allow greater interaction with the defensins. Note that the carbohydrate capsule of some bacteria contributes to resistance against defensins (62). Although HNPs and θ defensins have been found to have lectin activity (63), our findings suggest that this type of activity is unlikely to account for binding to IAV. In addition, binding of HNPs to RfSP-DnCRD cannot be explained by lectin activity because this protein contains no carbohydrate attachments. We cannot exclude a contribution of lectin activity to binding to natural human SP-Ds or full-length recombinant SP-Ds that have O-linked sugars and one N-linked sugar in the collagen domain. HNPs did not inhibit HA activity of IAV, indicating that they do not directly interfere with binding of the HA to ligands on RBCs. However, HNPs strongly interfered with the HA inhibitory activity of SP-D. HNPs also interfered with neutralizing activity of SP-D and vice versa. This antagonistic interaction between HNPs and SP-D occurred when HNPs and SP-D were incubated together simultaneously with IAV, and was not observed when either protein was added in a delayed manner to IAV that had been initially incubated with SP-D or HNPs for 10 min. Furthermore, the RfSP-DnCRD trimer alone (which has no neutralizing activity on its own) was sufficient to interfere with neutralizing activity of HNPs. These results suggested that SP-D might bind directly to HNPs via its CRD. Binding of SP-D to HNPs was confirmed and the mechanism characterized. Indeed, binding was mediated in large part by the C-terminal domains of SP-D. This binding was therefore distinct from the interaction of HNPs to C1q which is mediated by binding to the C1q collagen domain (34). Binding to SP-D was specific given that other collectins including MBL, SP-A, and the SP-D/MBLnCRD chimera either did not bind or had greatly reduced binding. Binding of SP-D to HNPs was increased at low pH and low ionic strength and thus resembles binding of HNPs to other ligands. These results suggest that SP-D may interact more strongly with HNPs in acidic microenvironments such as might occur in inflamed tissues. However, binding of HNPs to SP-D, and functional interactions with SP-D, were substantial at physiological pH and ionic strength. Binding of SP-D to HNPs is not mediated by the calcium-dependent lectin activity of SP-D. Binding of SP-D to IAV and various other microbial ligands is mediated by its calcium-dependent lectin activity and is greatly affected by the degree of multimerization of SP-D. This is illustrated by reduced binding of natural SP-D trimers to IAV as compared with binding of dodecamers and by the markedly reduced binding of RfSP-DnCRD to IAV (49). In contrast, binding of SP-D to HNP was not affected by the degree of multimerization of SP-D. HNP2 bound significantly more than HNP1 to SP-D again indicating potentially important differences in activities of these two HNPs. Preincubation of HNPs with SP-D caused reduced binding of SP-D to the SP-D-sensitive Phil 82 strain (Fig. 7⇑). This result is consistent with the antagonistic effects of HNPs on the HA inhibitory and neutralizing activity of SP-D for this strain. It appears likely from these results that HNPs bind to SP-D near enough to the viral (and carbohydrate) binding site of SP-D that they can in some cases interfere with binding of SP-D to IAV. Of interest, a different result was found when HNPs were first incubated with either Phil 82 or PR-8 strains of IAV. In this case, binding of SP-D was actually increased. This is of particular interest with respect to the PR-8 strain because it suggests that in some circumstances HNPs could form a bridge between SP-D and a resistant viral strain. This concept was also supported by the finding that the combination of HNP1 and SP-D had cooperative activity against PR-8 on an HA inhibition assay (Table III⇑) and a neutralization assay (data not shown). Overall, our results suggest that complex functional interactions may occur between HNPs and SP-D with competitive effects in some instances, and cooperative effects in others. Important variables that may determine whether cooperative or antagonistic interactions occur include the viral strain involved and the sequence of incubation of IAV with HNPs or SP-D. One aspect that we have not studied that may be important with respect to functional activities of HNPs is oligomerization. The finding that the RfSP-DnCRD and HNPs precipitate from solution suggests that formation of a lattice may occur involving dimerization of higher levels of oligomerization of the HNPs (64). Such interactions could be even more complex when multimeric forms of SP-D interact with HNPs in solution. Some competitive effects were more pronounced with high molecular mass multimers of SP-D and HNPs in our studies (see Table II⇑ and data not shown), which could reflect higher propensity to precipitation in these circumstances. Variations in the propensity of different HNPs (or polymorphic forms of SP-D) to precipitate in combination with SP-D could account for seemingly paradoxical antagonistic activity in some assays and additive activity in others. Further studies will be needed to explore these possibilities. In this study, some differences in activity of HNP1 and HNP2 were noted in antiviral activity (Fig. 1⇑) or binding to SP-D (Fig. 8⇑). HNP1 only differs from HNP2 by the presence of a single additional alanine residue at the N terminus (65). However, there is ample precedent for differences between the activities of HNPs from other studies. HNPs 1–3, which all differ by one N-terminal amino acid, have substantial differences in activity against Candida (65), and HNP1 and 2 differ in activity against certain bacterial strains (66) and in their ability to modify adaptive responses to OVA in mice (67). Although there was a measurable difference in endotoxin contamination in the HNP1 and 2 preparations in this study, the concentrations were quite low and unlikely to be responsible for differences in binding to SP-D. Note also that addition of increasing concentrations of endotoxin to HNPs did not alter binding to SP-D. The additional alanine on HNP1 is on the hydrophilic face between the two cysteine molecules that define the beginning and end of the loop. Study of the effects of other additions in this location on antiviral activity or interactions with SP-D would be of great interest. One concern is that our findings reflect in vitro interactions of SP-D and HNPs which may not be relevant in vivo. However, we show that HNPs not only bind to recombinant forms of SP-D and alter its functional activity, but also bind to and precipitate natural SP-D from BAL fluid. In addition, HNPs reduce the HA inhibitory activity of BAL fluid against the common human Phil82 strain, which we have previously shown to be predominantly mediated by SP-D (27). There are many circumstances in which HNPs are expected to encounter surfactant proteins in vivo. Most infections (including the early phase of IAV infection) are accompanied by neutrophil influx into the lung, and more severe IAV infection is characterized by increased neutrophil influx (68). Although HNPs are mainly concentrated in intracellular phagocytic vacuoles of neutrophils, some amount of HNPs are released into the surrounding milieu. Some chronic lung inflammatory states are characterized by elevated levels of HNPs in BAL fluid (including tuberculosis (32) and α1-antitrypsin deficiency (33)). Very high levels of HNPs likely are present in the immediate vicinity of activated neutrophils. Hence, it is likely that concentrations of HNPs used in our experiments interact with SP-D in vivo under some circumstances (including during IAV infection). Of interest, HNPs and SP-D are also both present in cervical fluid and could interact with respect to host defense against sexually transmitted infections. Interactions could also occur at other sites where defensins and SP-D are expressed (e.g., skin, gastrointestinal tract) (31). In addition to their antimicrobial activity, HNPs have additional functions, including proinflammatory signaling (39) and cytotoxic activities at high concentrations (37). We speculate that one mechanism through which SP-D mediates anti-inflammatory effects in the human lung involves binding to HNPs resulting in reduction in these proinflammatory and cytotoxic effects. In chronic inflammatory states, it is possible that persistent elevation of HNPs in alveolar lining fluid leads to depletion of SP-D. Examples of such a phenomenon might be cystic fibrosis (69), emphysema, or smoking (70). Note that deficiency of SP-D in mice results in emphysematous changes (17, 18). An adverse effect of HNPs on SP-D would be analogous to the impact of neutrophil proteases on SP-D (i.e., impairing SP-D function by cleavage of residues in the CRD) (46). We recently found that incubation of activated neutrophils with normal donor BAL fluid caused marked reduction in SP-D levels and antiviral activity (our unpublished data). Studies are underway to sort out the extent to which this reflects release of HNPs, oxidant damage, or proteolytic degradation. Further studies involving BAL fluid from subjects with inflammatory conditions, or animal models, will be needed as well to determine the relevance of interactions of HNPs with SP-D in vivo. It will be of additional interest to determine whether β-defensins released from respiratory epithelial cells inhibit IAV infection or interact with SP-D, because a recent report showed anti-influenza activity for one of the β-defensins (71). We gratefully acknowledge Drs. R. Alan Ezekowitz and Kazue Takahashi for providing RhMBL and the mAb directed against MBL and Dr. Jeffrey Whitsett for providing SP-A. ↵1 This work was supported by National Institutes of Health Grants HL69031 (to K.L.H.) and HL29594, 44015 (to E.C.C.). ↵3 Abbreviations used in this paper: IAV, influenza A virus; SP-D, surfactant protein D; HNP, human neutrophil peptide; HA, hemagglutination; Rh, recombinant human; CRD, carbohydrate recognition domain; MBL, mannose-binding lectin; MDCK, Madin-Darby canine kidney; HAU, HA unit; BAL, bronchoalveolar lavage. Morens, D.. 2003. Influenza-related mortality: considerations for practice and public health. J. Am. Med. Assoc. 289: 227-229. Webby, R. J., R. G. Webster. 2003. Are we ready for pandemic influenza?. Science 302: 1519-1522. Daher, K., M. Selsted, R. Lehrer. 1986. Direct inactivation of viruses by human granulocyte defensins. J. Virol. 60: 1068-1074. Seo, S., R. Webster. 2002. Tumor necrosis factor α exerts powerful anti-influenza virus effects in lung epithelial cells. J. Virol. 76: 1071-1076. Wang, X., L. Ming, H. Zheng, T. Muster, P. Palese, A. B. A., and A. Garcia-Sastre. 2000. Influenza A virus NS1 protein prevents activation of NFκB and induction of α/β interferon. J. Virol. 74: 11566–11573. Li, W., H. Li, R. Lu, F. Li, M. Dus, P. Atkinson, E. Brydon, K. Johnson, A. Garcia-Sastre, L. Ball, et al 2004. Interferon antagonist proteins of influenza and vaccinia viruses are suppressors of RNA silencing. Proc. Natl. Acad. Sci. USA 101: 1350-1355. Hartshorn, K. L., E. C. Crouch, M. R. White, P. Eggleton, A. I. Tauber, D. Chang, K. Sastry. 1994. Evidence for a protective role of pulmonary surfactant protein D (SP-D) against influenza A viruses. J. Clin. Invest. 94: 311-319. Hartshorn, K., K. Reid, M. White, S. Morris, J. Jensenius, E. Crouch. 1996. Neutrophil deactivation by influenza A viruses: mechanisms of protection after viral opsonization with collectins and hemagglutination-inhibiting antibodies. Blood 87: 3450-3461. Hartshorn, K., D. Chang, K. Rust, M. White, J. Heuser, J. E.. 1996. Crouch. Interactions of recombinant human pulmonary surfactant protein D and SPD multimers with influenza A. Am. J. Physiol. 271: L753-L762. Hartshorn, K., M. White, V. Shepherd, K. Reid, J. Jensenius, E. Crouch. 1997. Mechanisms of anti-influenza activity of pulmonary surfactant proteins A and D: comparison with other collectins. Am. J. Physiol. 273: L1156-L1166. Hartshorn, K., M. White, D. Voelker, J. Coburn, K. Zaner, E. Crouch. 2000. Mechanism of binding of surfactant surfactant protein D to influenza A viruses: importance of binding to hemagglutinin to antiviral activity. Biochem. J. 351: 449-458. LeVine, A., J. Whitsett, K. Hartshorn, T. Korfhagen. 2001. Surfactant protein D enhances clearance of influenza A virus from the lung in vivo. J. Immunol. 167: 5868-5873. LeVine, A., K. Hartshorn, J. Elliot, J. Whitsett, T. Korfhagen. 2001. Surfactant protein A modulates both innate and adaptive defense responses to pulmonary influenza A virus infection. Am. J. Physiol. 282: L563-L572. Palaniyar, N., H. clark, J. Nadesalingam, S. Hawgood, K. B. M. Reid. 2003. Surfactant protein D binds genomic DNA and apoptotic cells, and enhances their clearance, in vivo. Ann. NY Acad. Sci. 1010: 471-475. Clark, H., N. Palaniyar, S. Hawgood, K. B. M. Reid. 2003. A recombinant fragment of human surfactant protein D reduces alveolar macrophage apoptosis and pro-inflammatory cytokines in mice developing pulmonary emphysema. Ann. NY Acad. Sci. 1010: 113-116. Korfhagen, T., V. Sheftlyevitch, M. Burhans, M. Bruno, G. Ross, S. Wert, M. Stahlman, A. Jobe, M. Ikegami, J. Whitsett, J. Fisher. 1998. Surfactant protein D regulates surfactant phospholipid homeostasis in vivo. J. Biol. Chem. 273: 28438-28443. Botas, C., F. Poulain, J. Akiyama, C. Brown, L. Allen, J. Goerke, J. Clements, E. Carlson, A. Gillespie, C. Epstein, S. Hawgood. 1998. Altered surfactant homeostasis and alveolar type II cell morphology in mice lacking surfactant protein D. Proc. Natl. Acad. Sci. USA 95: 11869-11874. Wert, S., M. Yoshida, A. LeVine, M. Ikegami, T. Jones, G. Ross, J. Fisher, T. Korfhagen, J. Whitsett. 2000. Increased metalloproteinase activity, oxidant production, and emphysema in surfactant protein D gene-inactivated mice. Proc. Natl. Acad. Sci. USA 97: 5972-5977. Hartshorn, K., E. Crouch, M. White, M. Colamussi, A. Kakkanatt, B. Tauber, V. Shepherd, K. Sastry. 1998. Pulmonary surfactant proteins A and D enhance neutrophil uptake of bacteria. Am. J. Physiol. 274: L958-L969. Brinker, K., E. Martin, P. Borron, E. Mostaghel, C. Doyle, C. Harding, J. Wright. 2001. Surfactant protein D enhances bacterial antigen presentation by bone-marrow derived dendritic cells. Am. J. Physiol. 281: L1453-L1463. Borron, P., E. Crouch, J. Lewis, J. Wright, F. Possmayer, L. Fraher. 1998. Recombinant rat surfactant-associated protein D inhibits human T lymphocyte proliferation and IL-2 production. J. Immunol. 161: 4599-4603. Nadesalingam, J., A. L. Bernal, A. W. Dodds, A. C. Willis, D. J. Mahoney, A. J. Day, K. B. M. Reid, N. Palaniyar. 2003. Identification and characterization of a novel interaction between pulmonary surfactant protein D and decorin. J. Biol. Chem. 278: 25678-25687. Palaniyar, N., J. Nadesalingam, K. B. M. Reid. 2003. Innate immune collectins bind nucleic acids and enhance DNA clearance in vitro. Ann. NY Acad. Sci. 1010: 467-470. Lausen, M., N. Lynch, A. Schlosser, I. Tornoe, S. Saekmose, B. Teisner, A. Willis, E. Crouch, W. Schwaeble, U. Holmskov. 1999. Microfibril associated protein 4 is present in lung washings and binds to the collagen region of lung surfactant protein D. J. Biol. Chem. 274: 32234-32240. Holmskov, U., P. Lawson, B. Teisner, I. Tornoe, A. Willis, C. Morgan, C. Koch, K. Reid. 1997. Isolation and characterization of a new member of the scavenger receptor family, glycoprotein-340 (gp340), as a lung surfactant protein D binding molecule. J. Biol. Chem. 272: 13743-13749. Holmskov, U., J. Mollenhauer, J. Madsen, L. Vitved, J. Gronlund, I. Tornoe, A. Kliem, K. Reid, A. Poustka, K. Skjodt. 1999. Cloning of gp340, a putative opsonin receptor for lung surfactant protein D. Proc. Natl. Acad. Sci. USA 96: 10794-10799. Hartshorn, K. L., M. R. White, T. Mogues, T. Ligtenberg, E. Crouch, U. Holmskov. 2003. Lung and salivary scavenger receptor glycoprotein-340 contribute to the host defense against influenza A viruses. Am. J. Physiol. 285: L1066-L1076. Cole, A., P. Dewan, T. Ganz. 1999. Innate antimicrobial activity of nasal secretions. Infect. Immun. 67: 3267-3275. Singh, P. K., B. F. Tack, P. B. McCray, Jr, M. J. Welsh. 2000. Synergistic and additive killing by antimicrobial factors found in human airway surface liquid. Am. J. Physiol. 279: L799-L805. Ganz, T.. 2003. Defensins: antimicrobial peptides of innate immunity. Nat. Rev. 3: 710-720. Madsen, J., A. Kliem, I. Tornoe, K. Skjolt, C. Koch, U. Holmskov. 2000. Localization of lung surfactant protein D on mucosal surfaces in human tissues. J. Immunol. 164: 5866-5870. Ashitani, J., H. Mukae, T. Hiratsuka, M. Nakazato, K. Kumamoto, S. Matsukura. 2002. Elevated levels of α-defensins in plasma and BAL fluid of patients with active pulmonary tuberculosis. Chest 121: 519-526. Spencer, L. T., G. Paone, P. M. Krein, F. N. Rouhani, J. Rivera-Nieves, M. L. Brantly. 2004. Role of human neutrophil peptides in lung inflammation associated with α1-antitrypsin deficiency. Am. J. Physiol. 286: L514-L520. vandenBerg, R. H., M. C. Faber-Krol, S. vanWetering, P. S. Hiemstra, M. R. Daha. 1998. Inhibition of activation of the classical pathway of complement by human neutrophil defensins. Blood 92: 3898-3903. Lichtenstein, A. K., T. Ganz, T. M. Nguyen, M. E. Selsted, R. I. Lehrer. 1988. Mechanism of target cytolysis by peptide defensins: target cel metabolic activities, possibly involving endocytosis, are crucial for expression of cytotoxicity. J. Immunol. 140: 2686-2694. Kagan, B. L., M. E. Selsted, T. Ganz, R. I. Lehrer. 1990. Antimicrobial defensin peptides form voltage-dependent ion-permeable channels in planar lipid bilayer membranes. Proc. Natl. Acad. Sci. USA 87: 210-214. Okrent, D. G., A. K. Lichtenstein, T. Ganz. 1990. Direct cytotoxicity of polymorphonuclear leukocyte granule proteins to human lung-derived cells and endothelial cells. Am. Rev. Respir. Dis. 141: 179-185. Chertov, O., D. F. Michiel, L. Xu, J. M. Wang, K. Tani, W. J. Murphy, D. L. Longo, D. D. Taub, J. J. Oppenheim. 1996. Identification of defensin-1, defensin-2, and CAP37/azurocidin as t-cell chemoattractant proteins released from interleuking-8-stimulated neutrophils. J. Biol. Chem. 271: 2935-2940.
vanWetering, S., S. P. Mannesse-Lazeroms, M. A. VanSterkenburg, M. R. Daha, J. H. Dijkman, P. S. Hiemstra. 1997. Effect of defensins on interleukin-8 synthesis in airway epithelial cells. Am. J. Physiol. 272: L888-L896. van Wetering, S., A. C. van der Linden, M. A. van Sterkenburg, W. I. de Boer, A. L. Kuijpers, J. Schalkwijk, P. S. Hiemstra. 2000. Regulation of SLPI and elafin release from bronchial epithelial cells by neutrophil defensins. Am. J. Physiol. 278: L51-L58. Aarbiou, J., M. Ertmann, S. van Wetering, P. van Noort, D. Rook, K. F. Rabe, S. V. Litvinov, J. H. J. M. van Krieken, W. I. de Boer, P. S. Hiemstra. 2002. Human neutrophil defensins induce lung epithelial cell proliferation in vitro. J. Leukocyte Biol. 72: 167-174. Sweet, C., H. Smith. 1980. Pathogenicity of influenza virus. Microbiol. Rev. 44: 303-330. Sakai, S., H. Kawamata, N. Mantani, T. Kogure, Y. Shimada, K. Terasawa, T. Sakai, N. Imanishi, H. Ochiai. 2000. Therapeutic effect of anti-macrophage inflammatory protein 2 antibody in influenza virus-induced pneumonia in mice. J. Virol. 74: 2472-2476. Hartshorn, K.. 1996. Etiology of bacterial superinfections complicating influenza viral infection. L. Brown, Jr, and A. Hampson, Jr, and R. Webster, Jr, eds. Options for the Control of Influenza 499-508. Elsevier Science, Amsterdam. Engelich, G., D. Wright, K. Hartshorn. 2001. Acquired disorders of phagocyte function complicating medical and surgical illnesses. Clin. Infect. Dis. 33: 2040-2048. Hirche, T. O., E. C. Crouch, M. Espinola, T. J. Brokelman, R. P. Mecham, N. DeSilva, J. Cooley, E. Remold-O’Donnell, A. Belaaouaj. 2004. Neutrophil serine proteinases inactivate surfactant protein D by cleaving within a conserved sub-region of the carbohydrate recognition domain. J. Biol. Chem. 279: 27688-27698. Hartshorn, K. L., M. Collamer, M. Auerbach, J. B. Myers, N. Pavlotsky, A. I. Tauber. 1988. Effects of influenza A virus on human neutrophil calcium metabolism. J. Immunol. 141: 1295-1301. White, M., E. Crouch, D. Chang, K. Sastry, N. Guo, G. Engelich, K. Takahashi, R. Ezekowitz, K. Hartshorn. 2000. Enhanced antiviral and opsonic activity of a human mannose binding lectin and surfactant protein D fusion protein. J. Immunol. 165: 2108-2155. Crouch, E., Y. Tu, D. Briner, B. McDonald, K. Smith, U. Holmskov, K. Hartshorn. 2005. Ligand binding of human surfactant protein D: expression of a mutant trimeric collectin that shows enhanced interactions with influenza a virus. J. Biol. Chem. 280: 17046-17056. Super, M., S. Gillis, S. Foley, K. Sastry, J. E. Schweinle, V. J. Silverman, R. A. B. Ezekowitz. 1992. Distinct and overlapping functions of allelic forms of human mannose binding protein. Nat. Genet. 2: 50-55. Leth-Larsen, R., P. Garred, H. Jensenius, J. Meschi, K. Hartshorn, J. Madsen, I. Tornoe, H. O. Madsen, G. Sorensen, E. Crouch, U. Holmskov. 2005. A common polymorphism in the SFTPD gene influences assembly, function, and concentration of surfactant protein D. J. Immunol. 174: 1532-1538. Hartshorn, K., M. White, E. Crouch. 2002. Contributions of the N- And C-terminal domains of surfactant protein D to the binding, aggregation and phagocyte uptake of bacteria. Infect. Immun. 70: 6129-6139. Meschi, J., E. C. Crouch, P. Skolnik, K. Yahya, U. Holmskov, R. Leth-Larsen, I. Tornoe, T. Tecle, M. R. White, K. L. Hartshorn. 2005. Surfactant protein D binds to human immunodeficiency virus (HIV) envelope protein gp120 and inhibits HIV replication. J. Gen. Virol. 86: 3097-3107. Kandel, R., K. Hartshorn. 2001. Prophylaxis and treatment of influenza virus infection. BioDrugs 2001: 303-323. Zhang, L., W. Yu, T. He, J. Yu, R. Caffrey, E. Dalmasso, S. Fu, T. Pham, J. Mei, J. Ho, et al 2002. Contribution of human α-defensin 1, 2, and 3 to the anti-HIV-1 activity of CD8 antiviral factor. Science 298: 995-1000. Chang, T. L., J. Vargas, Jr, A. DelPortillo, M. E. Klotman. 2005. Dual role of α-defensin-1 in anti-HIV-1 innate immunity. J. Clin. Invest. 115: 765-773. Chang, T. L., M. E. Klotman. 2004. Defensins: natural anti-HIV peptides. AIDS Rev. 6: 161-168. Hartshorn, K. L., A. B. Karnad, A. I. Tauber. 1990. Influenza A virus and the neutrophil: a model of natural immunity. J. Leukocyte Biol. 47: 176-186. Hartshorn, K. L., D. E. Daigneault, A. I. Tauber. 1992. Phagocyte responses to viral infection. J. I. Gallin, Jr, and I. M. Goldstein, Jr, and R. Snyderman, Jr, eds. Inflammation: Basic Principles and Clinical Correlates 1017-1031. Raven Press, New York. Van Strijp, J. A., L. A. Miltenburg, M. E. van der Tol, K. P. Van Kessel, A. C. Fluit, J. Verhoef. 1990. Degradation of herpes simplex virions by polymorphonuclear leukocytes and monocytes. J. Gen. Virol. 71: 1205-1209. Caton, A., G. Brownlee, J. Yewdell, W. Gerhard. 1982. The antigenic structure of influenza virus A/PR/8/34 hemagglutinin (H1 subtype). Cell 31: 417-427. Campos, M. A., M. A. Vargas, V. Regueiro, C. M. Llompart, S. Alberti, J. A. Bengoechea. 2004. Capsule polysaccharide mediates bacterial resistance to antimicrobial peptides. Infect. Immun. 72: 7107-7114. Yasin, B., W. Wang, M. Pang, N. Cheshenko, T. Hong, A. J. Waring, B. C. Herold, E. A. Wagar, R. I. Lehrer. 2004. Theta defensins protect cells from infection by herpes simplex virus by inhibiting viral adhesion and entry. J. Virol. 78: 5147-5156. Zhang, X. L., M. E. Selsted, A. Pardi. 1992. NMR studies of defensin antimicrobial peptides. 1. Resonance assignment and secondary structure determination of rabbit NP-2 and human HNP-1. Biochemistry 31: 11348-11356. Raj, P. A., K. J. Antonyraj, T. Karunakaran. 2000. Large-scale synthesis and functional elements for the antimicrobial activity of defensins. Biochem. J. 347: (Pt. 3):633-641. Ericksen, B., Z. Wu, W. Lu, R. I. Lehrer. 2005. Antibacterial activity and specificity of the six human α-defensins. Antimicrob. Agents Chemother. 49: 269-275. Brogden, K. A., M. Heidari, R. E. Sacco, D. Palmquist, J. M. Guthmiller, G. K. Johnson, H. P. Jia, B. F. Tack, P. B. McCray. 2003. Defensin-induced adaptive immunity in mice and its potential in preventing periodontal disease. Oral Microbiol. Immunol. 18: 95-99. Kobasa, D., A. Takada, K. Shinya, M. Hatta, P. Halfmann, S. Theriault, H. Suzuki, H. Nishimura, K. Mitamura, N. Sugaya, et al 2004. Enhanced virulence of influenza A viruses with the hemagglutinin of the 1918 pandemic virus. Nature 431: 703-707. Postle, A., A. Mander, K. Reid, J. Wang, S. Wright, M. Moustaki, J. Warner. 1999. Deficient hydrophilic surfactant proteins A and D with normal surfactant phospholipid molecular species in cystic fibrosis. Am. J. Respir. Cell Mol. Biol. 20: 90-98. Honda, Y., H. Takahashi, Y. Kuroki, T. Akino, S. Abe. 1996. Decreased contents of surfactant proteins A and D in BAL fluids of healthy smokers. Chest 109: 1006-1009. Leikina, E., H. Delanoe-Ayari, K. Melikov, M. S. Cho, A. Chen, A. J. Waring, W. Wang, Y. Xie, J. A. Loo, R. I. Lehrer, L. V. Chernomordik. 2005. Carbohydrate-binding molecules inhibit viral fusion and entry by crosslinking membrane glycoproteins. Nat. Immunol. 6: 995-1001. DeSilva, N. S., I. Ofek, E. C. Crouch. 2003. Interactions of surfactant protein D with fatty acids. Am. J. Respir. Cell Mol. Biol. 29: 757-770.